Biosafety and biohazard supplies for your plant or jobsite. Biosafety supplies and biosafety products are necessary to keep your work, school, or home environment protected and OSHA compliant. Necessary OSHA biosafety supplies include universal precaution kits (UPKs), bloodborne pathogen kits, bodily fluid clean up kits, fluid control solidifiers, Red-Z fluid control solidifiers, biohazard bags, and latex gloves. 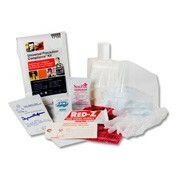 A universal precaution kit is your first step in the prevention of exposure to body or biohazardous fluids. 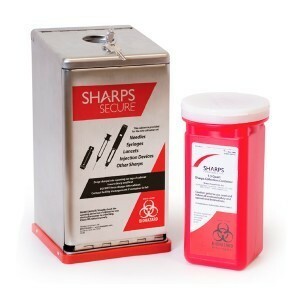 And if an accident does occur, you need the right biohazard cleanup supplies to get your site back to working order. Be sure to place one of these handy UPK cases or biohazard cleanup supplies near your first aid kit. First Aid and Safety's biosafety supplies, health and safety equipment, and biohazard equipment will keep you, your colleagues, students, family safe and secure from the threat of infection or contamination. All products are competitively priced, and ship fast. Call us today for products not yet listed in our online inventory. Our selection of Biosafety Clean Up Kits make cleaning up bodily fluids such as blood, urine, vomit and feces easier with a kit specifically designed to keep you protected while you clean up. These biosafety clean up kits help to protect the health of first responders with the proper supplies needed to get the job done. Universal precautions shall be observed to prevent contact with blood or other potentially infectious materials... When provision of handwashing facilities is not feasible, the employer shall provide either an appropriate antiseptic hand cleanser in conjunction with clean cloth/paper towels or antiseptic towelettes.